Our accredited industry experts design, install and maintain best of breed fire detection and suppression systems that comply with SABS, NFPA, FPASA, FDIA and SAQCC standards to safeguard your property and assets. We are active in South Africa and throughout the African continent. Electronic fire detection systems constantly monitor the environment and are able to provide an early warning and automatically trigger suppression systems to minimise or prevent losses associated with fire. An addressable fire detection system is able to pinpoint the location of every detection device, whereas a conventional fire detection system is only able to differentiate between zoned areas. 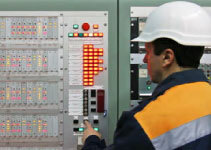 Either system can utilise a variety of fire detection devices. These include optical smoke detectors, smoke beam detectors, gaseous detectors, heat source detectors, linear heat detectors and aspirating air sample detectors to name a few. Fire control evacuation alarms sound an alarm tone followed by a voice message announcing that an emergency has occurred and that the building should be evacuated. The system can be a stand-alone fire alarm system, it can be integrated into a public address system, or it can be integrated with the building management software. The alarm can be activated manually or by means of an automatic detection device or system. Fire control panels can be monitored off site through a radio link typical of burglar alarm systems, or they can be linked to a 24 / 7 / 365 off site monitoring control room where required. 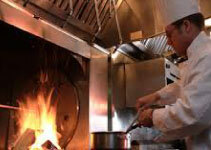 Gas suppression systems use gaseous mixtures to extinguish fires. These gaseous mixtures are residue free and are deployed in environments where rapid fire extinguishing is required. 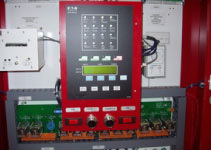 A gas suppression system is typically triggered automatically by an electronic fire detection system and includes gasses such as FM200, Novec, CO2, Inergen, Pyroshield, Pro-Inert and Argonite. Dry Chemical Systems are typically large industrial static pipe systems that protect against a variety of light to heavy industrial hazards. These integrated systems combine the suppression capability of dry chemicals with reliable fire detection systems to help safeguard people, assets and operations. 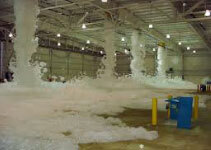 Foam fire suppression systems are particularly effective where flammable liquids are ignited. The foam suppression agent cools and coats the burning liquid, restricting the supply of oxygen and suppressing combustion. 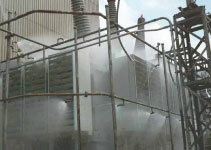 Foam fire suppression systems are used in flammable liquid transfer pipelines and storage tanks, chemical processing plants, fuel refineries, aircraft operations, LPG manufacturing and storage areas. 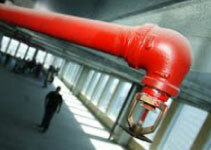 A vehicle fire suppression system is a fire suppression system installed on any type of vehicle. They are especially prevalent in the mobile heavy equipment segment and are designed to protect mobile equipment from fire damage and related losses. These pre-engineered systems are designed per the parameters of the individual machine. 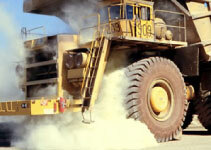 The vehicle system has become a vital safety feature to several industries and is most commonly used in the mining, forestry, landfill and mass transit industries. A fixed fire sprinkler system distributes water via an application specific sprinkler system, designed in order to comply with industry standards and regulations. The system distributes water when the effects of a fire activate a mechanical heat sensitive device, typically once a predetermined temperature has been exceeded in a specific area. 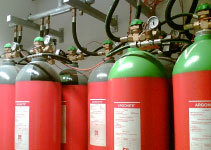 Deluge fire suppression systems consist of water spray nozzles connected to a continuous water supply source, activated by an automatic fire detection system. The system uses medium or high velocity water spray nozzles that generate a deluge of water to suppress combustion of the fire fuel source. 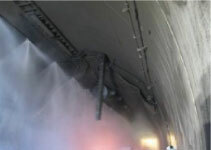 Water mist fire suppression systems force water through micro nozzles at a very high pressure to create a water vapour mist. Fire extinguishing occurs due to a combination of the cooling effect of the water mist and the displacement of oxygen caused by the expansion of the water mist as it is vaporised. Water mist systems provide improved asset protection through minimising potential water damage, as the water mist evaporates on contact with the heat source. Kitchen fire suppression systems are activated by a means of a manual switch or automatically by fusible links located in close proximity to cooking appliances. The fusible links melt when exposed to excessive heat during a fire causing a cartridge to activate, discharging propellant gas into the suppression agent tank. A piping system then distributes the suppression agent to nozzles situated above the cooking appliances, in the hood above the filters and in the duct above the cooking hood. 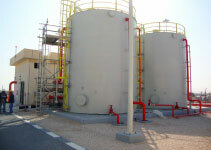 We design, install and commission fire water storage tanks and fire water pump systems, together with the ancillary water reticulation system, where there is an insufficient municipal supply of water for a compliant water suppression system. 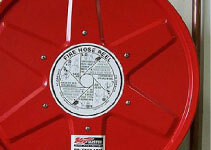 Fire Hose Reels are located to provide a reasonably accessible and controlled supply of water to combat a fire. The length of a fully extended fire hose is 30 meters and they are located within a building to create an overlapping area that can effectively suppress a fire in any part of the structure. 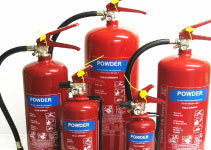 A complete range of portable fire extinguishers is available for every type of application. DCP extinguishers are available from 1.5kg to 50kg portable units, while portable CO2 extinguishers are available in 2kg and 10kg units. 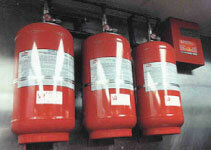 Other fire suppression agents such as foam, water, gas, vaporising liquid and wet chemicals are also available. 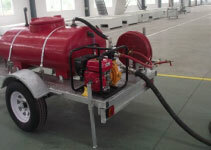 We supply fire suppression trailers that are made to client specific requirements. Fire suppression trailers come complete with a generator, water pump and large volume tanks, fire beaters and fire extinguishers. Trailer units are suitable to situations where the installation of permanent equipment is not cost effective. A fire detection and suppression system needs to be checked periodically by a certified person to ensure that it is operational and that it is able to sound an alarm and suppress a fire when activated. 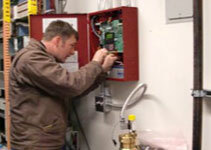 The fire detection and suppression system maintenance needs to be documented as required by the relevant standards. Continual, proactive maintenance of a fire detection and suppression system ensures that the system will be ready at all times to operate as required in order to safeguard people, operations and assets. The fire system maintenance program is an integral part of a fire risk mitigation strategy and that minimises the probability of loss caused by fire. We supply a range of protective clothing systems for hazardous environments and situations that provide protection for workers and safety personnel. 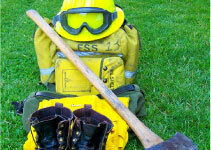 Our range of fire combatting gear compliments any fire suppression solution.